I composed, performed, and recorded the musical score for this serialized investigative podcast, produced by Michael Gonzalez in Los Angeles. The first season (11 episodes) finds Plainview Public Radio host Tara Bay on a mission to vindicate Jane Doe, the sole survivor of a sadistic serial killer known as The Scientist. Jane has been jailed as an accomplice while her tormentor eludes the authorities. It’s dark and disturbing, with great performances set in a variety of locations. Here’s a post I wrote about the scoring process, including an interview with the producer. Caleb J Ross and I debated taboo subjects and uncommon dilemmas—often as devil’s advocates—with absurdity, hilarity, and profundity. I’ve linked a few of my favorites episodes (of 57) below, each of which you can get through faster than a DVRed sitcom. 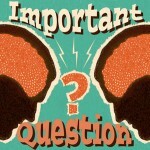 Find the complete episode guide at ImportantQuestionPodcast.com or see Facebook.com/ImportantQuestion for even more fun media and discussion. 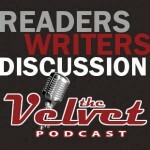 A few years ago, I moderated or participated in several episodes of a writing/reading-themed podcast spawned by a community called The Velvet. The site’s no longer available, so I’m offering them here for your continued enjoyment.